Explore sustainability, build community, and strengthen your skills with the Student Sustainability Hub. Our programs are designed for students who want to create positive change on campus and beyond. Choose your own adventure and thrive! You belong! 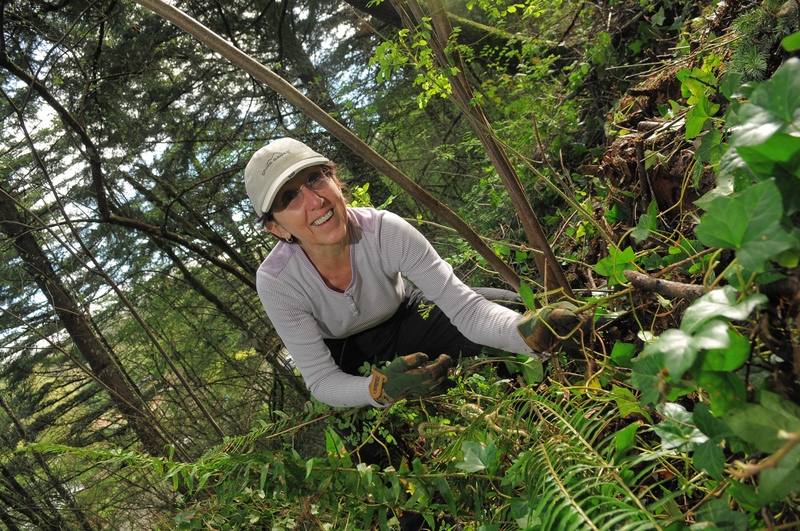 Join a club and to get in on sustainable actions across the district. 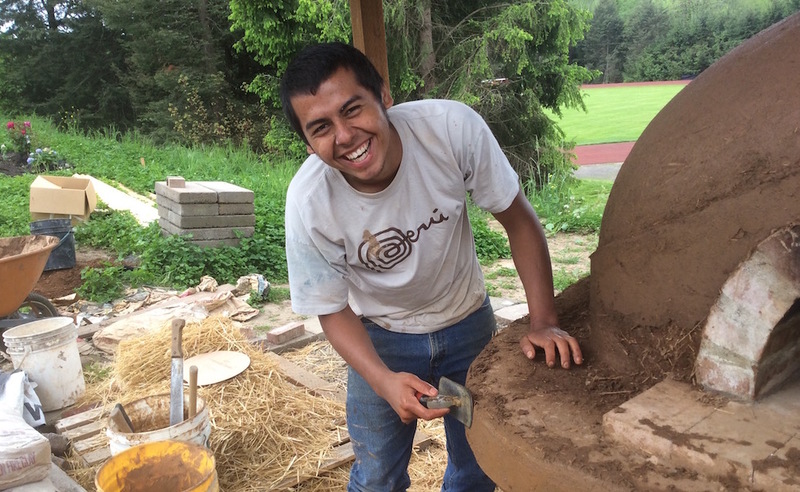 Learn more about the Habitat Team, Cascade Environmental Justice Club, and more. Keep up with all the sustainability related events at PCC by adding our calendar to yours! 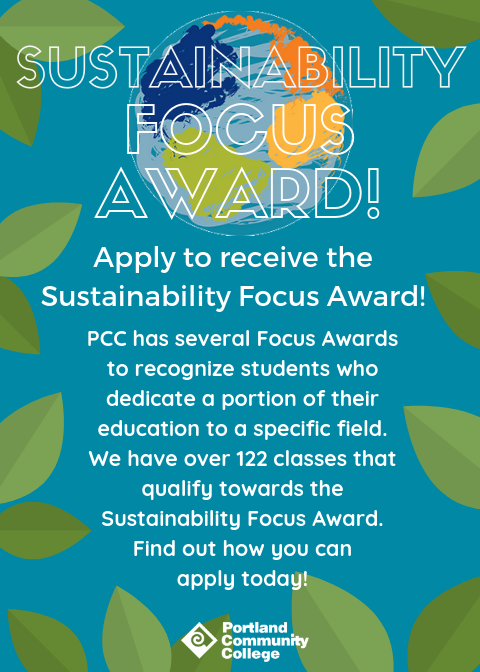 Learn about PCC’s Sustainability Focus Award or find green classes like HE264 Health, Food, and the Environment for the upcoming term. Come work with us! There are plenty of works study and part time jobs that involve sustainability at PCC! Get outside and help our Learning Gardens thrive or help restore important wildlife habitat! Learn more about sustainability related events around PCC under the Events tab below. Featured Campaign: Ban the Sale of Single Use Plastics! Students are leading a campaign to ban the sale of single use plastics! Each campus has tabling sessions, film screenings and petition signings focused on cutting out plastic pollution at PCC. Learn more about the steps you and PCC can take, sign the PCC Plastic Bottle Ban petition and enter into a drawing for a 4Ocean recycled ocean plastic bracelet! Have an opportunity to add? If you have something to add to this page, submit the information using this form. You can find us every Tuesday, except for campus closures, from 11:30-3pm on the patio outside Building 5! Will we have seedlings??? YES!!! Looking to join the team of students, staff, and faculty who are dedicated to creating sustainable solutions? Opportunities for volunteering on sustainability projects at PCC pop up regularly, so check here for regular updates! Take a break from classrooms and books and get your hands dirty! Join us in the Learning Garden (across from parking lot 14). Come for a few minutes or the whole time. Meet great people, find purpose in growing food for yourself and for others. Learn, share, teach. We will provide gloves, tools, and tasty snacks. Volunteers get to take home a portion of the day’s harvest! 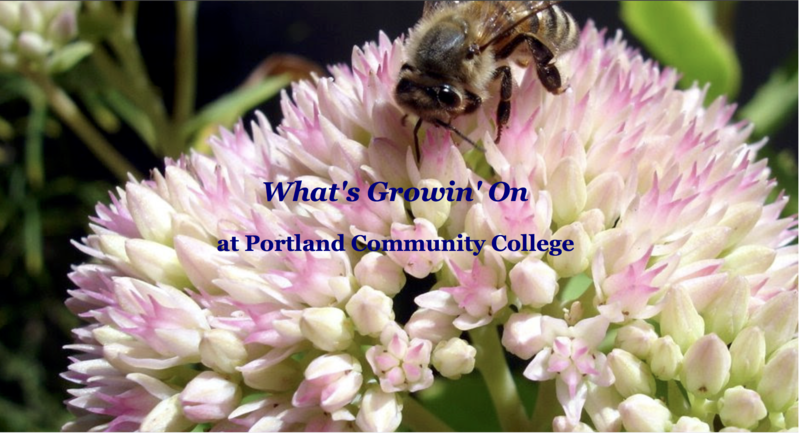 If you are interested in starting up the Organic Gardening Club, contact Venus at venus.barnes@pcc.edu. Megan, Stella and Madi are working on planting our Learning Garden’s new terraced garden. It is full of natives, eatables, and fruit trees. Our goal is to provide food for wildlife and people as well as habitat enhancement. If you are interested in working with them on this or some other cool projects (Stella is working on “painting” moss on the cement blocks), Contact megan.porter15@pcc.edu. They will be down there regularly on Monday’s from 11am to noon. The Rock Creek Learning Garden has volunteer sessions on Tuesdays, Wednesdays, and Thursdays from 9:00 am – 1:00 pm. 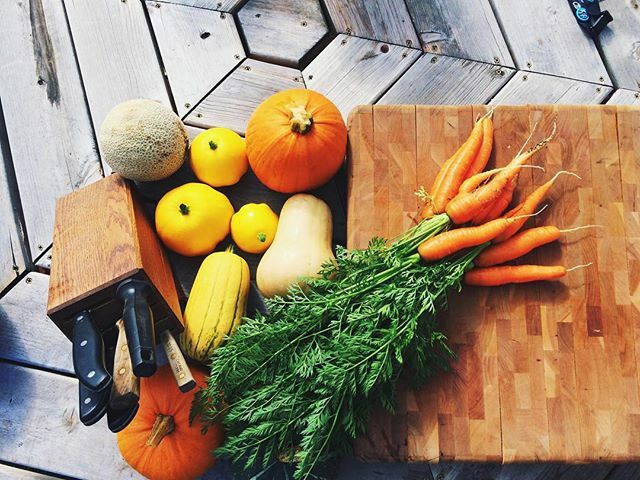 Earn $5 credit per hour to buy fresh produce at Portlandia Farmstandia. More information is available at the Learning Garden’s Get Involved page. The Newberg Center Learning Garden would love for you to come and volunteer! Come for a half hour or longer. Meet great people, learn about growing food, pollinators, and what makes the learning garden special. We’ll provide gloves, tools, and snacks. Volunteers get to take home a portion of the day’s harvest! Contact Corrie at corrie.larson@pcc.edu for more info. The Sustainability Focus award recognizes students who have completed a broad range of sustainability-related courses. The award is designed to encourage students to learn to see environmental issues from multiple perspectives and to increase their experience in this multi-disciplinary topic. The earning of this focus award can demonstrate to potential employers and transfer colleges that the student has a deep and broad understanding of sustainability issues. We frequently have work-study positions available at the campus and district-level. Please see the PCC Work Study page for available positions or email sustainability@pcc.edu. Application deadline is Wednesday May 1st @ 5:00pm. Complete and submit the online application found at https://tinyurl.com/ASPCC1920. Contact Ashley Hansen at 971-722-5379 or by email at ashley.hansen@pcc.edu with questions. Focus on issues of hunger and food insecurity among college students by providing access to food resources through the food pantry and SNAP (or applicable) programs. Experience working with a team and excellent organizational skills. Provide SNAP outreach and advocacy for students from the Pantry. Must be able to drive a vehicle and complete vehicle training program. Other duties as assigned. Position open until filled. Applications are available in the Student Leadership Office, Building 5, Room 115. Contact rylie.wolff@pcc.edu or nora.hernandez@pcc.edu with questions. Summary: Provide leadership with an eco-social justice focus to Southeast Student Life and Leadership team and as a District Student Council member. Increase sustainability efforts on campus and across the district by participating on committees and working with the Sustainability Office. Recognize and promote the intersectionality of environmental social justice. Hold PCC accountable for eco-social justice policies. ● Provide guidance, constructive feedback, and support to the Programming Team. If selected, individual interviews will be held the May 7th and 8th. Group interview will be held May 9th. If you are selected, please make time on those days to attend an interview. You can view our mandatory calendar which is linked in our application. Projects can be varied to align with student’s knowledge and experience. Position open until filled. Must be work study approved through financial aid. Please contact briar.schoon@pcc.edu with any questions, and to apply for the position after accepting your work study award. Keep up and organize the Environmental Center office. Contact Peter Ritson, Environmental Center Coordinator, peter.ritson@pcc.edu for more details. We looking for team members who have skills, experience or wants to further develop in, outreach, people skills, organization, and planning. Contact Peter Ritson, Environmental Center Coordinator, peter.ritson@pcc.edu for more details. Portland Community College’s Rock Creek Sustainability Office is looking for a passionate, enthusiastic and organized student to join our team to advance the college’s sustainability practices. Under direction of the campus Sustainability Coordinator, the Sustainable Practices Educator will assist with new and current sustainability practices and initiatives as well as provide administrative support to the team. Assist with the coordination and promotion of existing sustainability programs, such as the Green Office program and PowerShift. Contribute to our sustainability online presence, including website, Facebook, Instagram and Twitter accounts. Conduct research on potential new initiatives and opportunities that will contribute to the achievement of college-wide sustainability goals. Assist with the implementation of new sustainability programs/initiatives and develop sustainability resources. Conduct sustainability assessments and gather data for activities such as waste audits and energy conservation projects. Coordinate promotional activities and tabling during college events. Develop educational materials for staff and students and coordinate outreach campaigns. Perform general administrative tasks, including: note taking, writing document summaries, sending emails and returning phone calls. Passionate about sustainability or a related fields. A basic understanding of sustainability and social justice. Skills in data collection, critical thinking, project management, and data entry are a bonus. Ability to effectively organize and meet established deadlines. Possession of a high school diploma or equivalent. Application Details: Please email a resume, cover letter and two professional references to elaine.cole16@pcc.edu. If you have any questions, please call 971-722-7635. The Learning Garden Assistant will mainly work in PCC Rock Creek’s 3.64 acre Learning Garden, a pesticide and herbicide-free food growing space. Work in the garden may include raised bed preparation, planting, weeding, tool maintenance, irrigation maintenance, and weekly harvest for sale at Portlandia FarmStandia. The Learning Garden Assistant will also have the opportunity to interact with volunteers and students in the garden and demonstrate best practices. The Harvest and Farm Stand Associate will work with the Learning Garden team to prepare for and run Portlandia FarmStandia each Tuesday (~6-8 hours/Tuesday, April-October). This work will include harvesting, washing and packing crops in the garden and hoop house prior to sale, assisting with set-up and take-down of the farm stand, and providing support during farm stand hours by helping with transactions, engaging with customers and promoting Learning Garden services and events. Gain insight into running a small business and assist with marketing, outreach, customer service and donation of surplus produce to our community partners. This is a great opportunity for students interested in health, agriculture, or business, or for individuals who simply want to be involved in their community and develop their professional skill set. Get to know the learning garden at the PCC Rock Creek Campus by participating in seeding, field preparation, planting, weeding, and harvest. Share your knowledge with other students by providing sustainability loop tours on campus, tabling at events, and partnering in a position of leadership with the Learning Garden Club. The Sylvania Food Justice Club/Cohort is comprised of food justice champions from multiple Identity Based Equity Centers (IBEC) including the Queer Resource Center, Multicultural Center, Women’s Resource Center, and Veterans Resource Center. Collectively, the cohort organizes advocacy and education around food insecurity and how to help students in need. Our mission is to tackle the root cause that continues to perpetuate the same outcome. We stand by three fundamental strategies that can address systemic hunger by, teaching, connecting and advocating. This includes policies, practices, and norms here at PCC. At PCC Sylvania, we draw strength from all who support us on campus and in our community. We hope people across the city and state will see our efforts in taking the lead in addressing hunger here in Oregon. All are welcome. If you are interested in being a part of this cohort, email venus.barnes@pcc.edu. Inspired by students passionate about gardening and breaking down barriers to food security, we have created the Southeast campus’s first Food Justice Club. The club is open to all PCC students and is dedicated to building awareness and resources to empower fellow students. 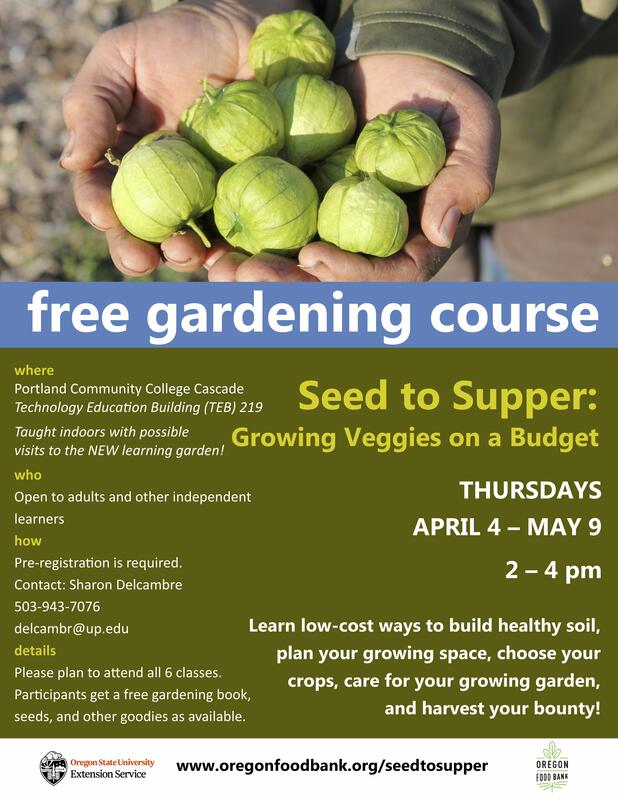 For more details, please contact selearninggarden@pcc.edu. Are you a student at Southeast and interested in getting involved in sustainability initiatives on campus? Join students, faculty, and staff in the Southeast Green Team! We are in the process of developing a learning garden that will be a comprehensive outdoor learning space for our students to learn, our faculty to teach in, and our Southeast Campus to enjoy. This will provide opportunities for students to work outside of the standard classroom and to connect sustainability and gardening with learning and everyday life. We promote a number of other green initiatives, like the Bike Rental Program and annual Earth Week events. If you are interested in learning more about the club or attending a meeting, contact Nicole Seery at nicole.seery@pcc.edu. The purpose of the club is to learn more about organic gardening, share gardening knowledge, plan events for the Learning Garden, and attend field trips and guest speaker events. There is still time to join. If you’re interested, email venus.barnes@pcc.edu. This club meets on Mondays at 11am in AM 101. If you’re interested, email madisen.lattanzi@pcc.edu. Would you like leadership and environmental field experiences? Come join the team! We don’t usually meet for two hours but sometimes we write grants, show movies, do a walkabout, or have a mini-work party. The Habitat Restoration Team, working with the Sylvania Grounds crew, PCC students and staff, and community members, works to remove invasive species, plant NW native plants, and help stabilize creek beds. To get involved, contact April Fong. This club works to prevent campus food waste by recovering and donating unsold, unconsumed food while promoting sustainability and giving back to our community. If you are interested in learning more, contact Stephanie Saunders at stephanie.saunders1@pcc.edu. Get involved with the garden and learn more about organic gardening, composting, and greenhouse production. Help host work parties and events in the Learning Garden. Now’s the time to get growing! For more info email: miriam.latzer@pcc.edu. Bi-weekly meetings starting Wednesday, November 16th from 6:30pm-7:30 pm in HT 205. The PAC wants to affect political action around the environment and social justice. While the problems in our community and our world can be heavy, you can join us to find hope and energy! We are a group of intelligent, informed, and passionate PCC students looking to make a difference. Thinking of starting a club? First contact the district sustainability department, who can connect you with people and resources that you will need to know. Who knows – maybe there’s already a club that exists, waiting for someone like you to step into a leadership role! Calling all gardeners! Interested in caring for a plot in the community beds at the Rock Creek Campus Learning Garden? Sign-ups begin soon. For more information, contact Elaine. Issues of environmental degradation, inequality, and economic disparity impact us all. Here at PCC we value our students, staff, and faculty and their commitment to sustainability as well as their advocacy and efforts towards creating more equitable, diverse and inclusive spaces across the district. We are supporting and fostering a culture of collaborative, innovative problem solving using environmental sustainability and social justice initiatives to accomplish these goals. From our learning gardens, water bottle fill stations, our great bike programs and farm stand, to our annual #EcoSocialJusticeEvent, we have been working together to address our community’s most pressing ecological and social challenges with fresh ideas. We also feel that it is important to both celebrate and give thanks and acknowledgement to the amount of time, money, and effort that students have put towards making Portland Community College a nationally and globally recognized higher education institution and leader in the sustainability movement. In 2008 the Associated Students of Portland Community College (ASPCC) District Student Council approved a ten cent addition to the student activity fee, creating The Green Initiative Fund. At the beginning of 2018, the ASPCC District Student Council unanimously agreed to change the name of this fund to the Eco Social Justice Grant (ESJG), this name change better reflects the broader scope of what these grants have been and will be dedicated to. This fund exists so that students, staff, and faculty can participate in our culture of innovation and contribute meaningful advances to sustainable practices. At PCC, our goal is to achieve sustainable excellence in all operations, to live our commitment to social justice, and to meet our targeted greenhouse gas reductions as detailed in the Climate Action Plan. If you have an idea for a project that moves PCC towards these outcomes, we want to hear from you! 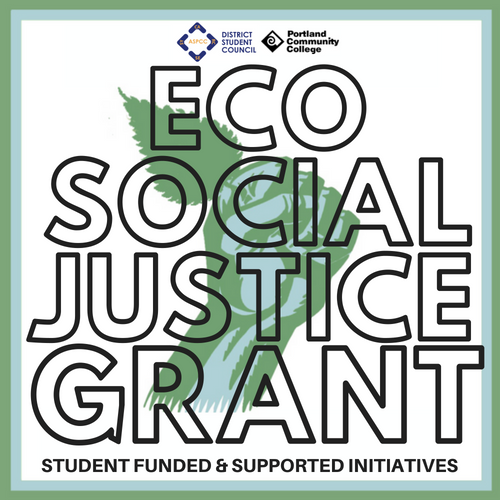 Learn more and apply for the Eco Social Justice Grant! Want to learn how to be more sustainable on the day-to-day? Take the Sustainable Choices Pledge. Stay in the loop of networking events in Portland, discuss goals and ideas for the future, and more! 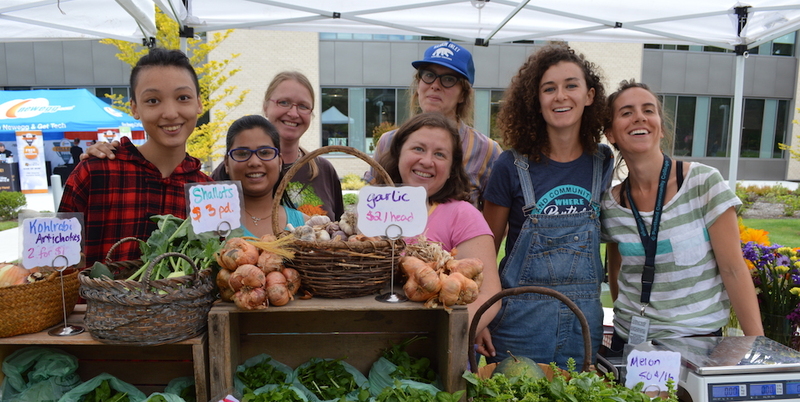 We know that keeping students fed is imperative to equitable student success, that diverting food waste lowers PCC’s carbon impact, and that projects like the Learning Garden and Food Forests build community resilience to the impacts of Climate Change. Panther Pantries are on all four comprehensive campuses and provide food for students in need: Cascade (Second Floor, Student Union Building); Rock Creek (Room 113, Building 5); Southeast (Room 105, Mt. Tabor Hall); and Sylvania (Room 102, College Center). Find more resources for students on PCC’s Student Life page. 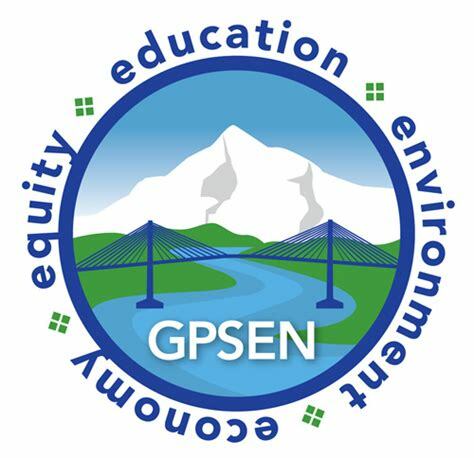 Check out the District Wide Learning Garden Newsletter!